Energy cables transport current of up to 500 Kilovolt (kV) across large distances. 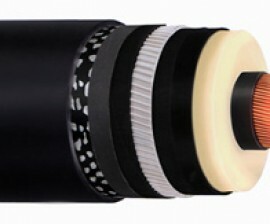 These high-voltage cables are produced on extrusion lines of up to 300 m length. The machine engineering company TROESTER, a global leader of cable extrusion line production, uses CONTI SYNCHROCHAIN polyurethane timing belts for the rotary drive of the rotating belt-type caterpillars in its innovative HV CCV lines. There are probably not many people who have not heard of “transitioning to renewable energy sources”. At the centre of the debates about additional new “power supply highways” there is TROESTER GmbH & Co. KG from Hanover. This company builds extrusion lines for rubber and plastics and is one of the two global leaders in the production of cable extrusion lines, on which submarine cables and underground cables are produced for transporting peak voltages of up to 500 kV across long distances. These cables are created by a special extrusion procedure, in which 3 insulation layers made of plastic are applied to a copper conductor at the same time. “There used to be only few central power plants producing electricity,” says Dirk Schmidt, sales manager for cable machines and plants at TROESTER. In the past few years, the company has mainly done business with countries in which new power grids are being built, for example, China, Russia or India. But since the transition to renewable energy sources has become an issue, Europe has become important for them again. “A multitude of new electricity producers has joined the market recently, above all producers of wind power, biomass-derived electricity and other alternative energy sources. The electricity market has become a lot more decentralised,” says Schmidt. Developing the grid requires thick energy cables so that electricity can be transferred across long distances. Troester cable extrusion lines such as the “Catenary Continuous Vulcanisation Line” (abbreviated: HV CCV) for cost-efficient production of cables for medium, high and peak voltage have massive dimensions. This is due to the size of the machines themselves and the production method used. A factory work room for a HV CCV line can be up to 50 m high and up to 350 m long. HV CCV lines use the patented “TWINROT” method. This method is based on two synchronous belt-type caterpillars of the RAGG type (Rotating Caterpillar RAGG) working as transport units. The complete pull-off unit of these RAGGs rotates around the horizontal axis. It is in these rotating belt-type caterpillars that CONTI SYNCHROCHAIN polyurethane timing belts, designed for transmitting extremely high torques, are used. Stephan Kellner of the construction department for cable machines at Troester explains the mode of operation of the belt-type caterpillars. “One rotating belt-type caterpillar RAGG is located at the beginning of a HV CCV line, another at the end. The copper core, which can be as thick as an arm, or the cable is transported through the extruder group by rotating belt-type caterpillars at up to 5000 Newton metres. Here, the copper conductor is insulated with plastic.” The pull-off units of the caterpillars turn the cable around its own axis for approx. 10 to 15 minutes. The cable insulating process progresses at approx 1m/min. When considering some of the facts, the incredible performance of the CONTI SYNCHROCHAIN in a HV CCV line becomes clear. By driving the belt-type caterpillar, the timing belt ensures that the cable to be insulated is guided from the start to the end of the line in a precisely defined rotating movement. 1 m of a peak voltage cable weighs nearly 50 kg, a finished rolled-up cable reel weighs up to 12 t and usually passes through a HV CCV line for up to 14 days. “CONTI SYNCHROCHAIN can be used for this purpose, because it is extremely tear-resistant and has an incredible tensile force. It can withstand dynamic stress of movements of up to 4 metres per second. Due to the CTD profile, the special design and special materials as well as the double-coiled S/Z rotation tension members made of aramid fibres, this polyurethane timing belt provides reliable power transmission both in case of high torques and in case of high dynamic stress. Timing belts of 68 mm width and 3500 mm length are installed in the belt-type caterpillars in the profile version CTD C14M”, says Andreas Ludwig. As a high-performance drive belt, CONTI SYNCHROCHAIN allows for contraflexure during multi-disk driving and is therefore a maintenance-free alternative for chain drives. Designing engineer Stephan Kellner: “Other drive systems such as chains or cogs were never really taken into consideration. We need a slip-free drive that does not need maintenance or lubrication. 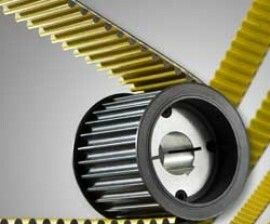 The fact that lubrication is not necessary due to the encapsulated installation situation, which makes the belt maintenance-free is a clear advantage of the polyurethane timing belt”.